The Homegrown Music Sampler CD! For the first time in over 20 years of that Homegrown Music has been on Public Radio, a compilation CD of recordings from the series is now available. 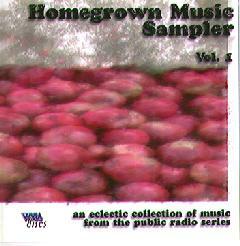 Released in March 1997, the Homegrown Music Sampler is as eclectic as program. The 73-minute CD features eighteen memorable peformances by some of the most outstanding artists from the archive, ranging from the well-known to the still-obscure, produced and compiled by the series' creator and producer George Graham. This unique recording may be ordered from WVIA by calling (570) 655-2808. Click Here for producer's notes. From the Selinsgrove, PA, area, The Badlees got their start around 1989 as Bad Lee White, and soon thereafter began appearing on Homegrown Music. Since then they have become one of the region's most popular bands, and in 1996 were signed to Polygram Records, which released their self-produced CD River Songs. They tirelessly tour from coast-to-coast and have appeared in China. Their song "Angeline Is Coming Home" reached the Billboard top singles chart. Over the years, HGM listeners have been treated to new Badlees material before they have released it on record. In concert the group often did a great bluesy, electrified version of this children's song, which has never previously been released. The Pousette-Dart Band were part of some of the biggest stadium rock concerts of the 1970s. They released four albums for Capitol during that decade, yielding several hits, including "Amnesia," but the band broke up when their brand of melodic, bluesy and folk-influenced pop fell off the charts during the punk-rock fad. Lewisburg, PA-bred Jon Pousette-Dart later moved to New York and became the voice of many commercial jingles. The group, with three of the original members, reunited during the 1990s, wrote new material and hoped to re-launch their recording career. They have been performing on and off since then, including two live Homegrown Music concerts. This never-released song, co-written by Jon Pousette-Dart and Al Anderson of NRBQ is a great rocker taken from their 1993 live performance for HGM. Recorded live 11/16/93. Engineer: Debbie Makara. George Wesley has been performing on Homegrown Music since 1976, when he was a member of the Dead Branch Band. He has become one of the region's most versatile and respected musicians, with reggae his musical trademark in recent years, performed with his Irietations bands, which have released several albums (including "Celebration of Creation" produced by George Graham). This song reflects the more thoughtful, introspective side of Wesley's lyric-writing. Another of the region's most popular bands, Blue Sparks were ubiquitous during 15 years together, which "officially" ended with the 1980s. Their theatrics and good-time music was legendary. The Homegrown Music version of this great song, a lament for the days of gas-guzzlers, won a national "unsigned band" competition and appeared on an Epic Records compilation album in 1986. Blue Sparks has in recent years been reuniting for special occasions. Lorne Clarke grew up in the far north of Canada where the radio and music were his best friends. He performed on the Toronto folk scene sharing venues with a young Jane Siberry. With a fascinating career that includes stints as a policeman, and a winning appearance on the "Gong Show" on TV, Clarke now farms in the Tunkhannock, PA area. A remarkable songwriter with a powerful voice, Clarke melds influences from both countries in his thoughtful, appealing songs. This session features help from George Wesley, with whom Homegrown Music brought Clarke together for what has become a lasting collaboration. Formed by Lehigh Valley guitarist and songwriter Joey Mutis III, Electric Farm reflects Mutis' eclecticism, with influences ranging from folk to jazz to reggae, sometimes with whimsical lyrics. In 1991, the group got to record with members of R.E.M. A fine Celtic and British-Isles folk influenced group from the Lehigh Valley, the Shanachians' several appearances on HGM are always welcome by listeners. They have also released at least two cassette albums. This old English song features vocalist Kathleen McGhee (who has since departed the group), in an outstanding performance. You want eclectic? How about a bluegrass version of the Talking Heads New wave anthem. This now-dissolved quartet from the Bethlehem area became one of the region's finest and most wonderfully wide-ranging acoustic groups, doing everything from Bill Monroe to Rolling Stones to Duke Ellington, plus some first-rate originals. Their version of this song has become legendary. One of the Keystone State's best bluesmen, Mike Dugan has been a ubiquitous fixture in both the Lehigh and Wyoming Valley areas for many years. He has released several CDs and cassette albums, including the acclaimed "Blues from the Rust Belt." This great treatment of a classic slow blues made famous by Lowell Fulson shows Dugan and his band in elegant form. A true legend, Jack Hardy is one of the few Homegrown Music veterans to be the subject of a tribute album (featuring the Roches). John Gorka's "Jack's Crows" was also dedicated to this remarkable writer and wry performer. A founder of Fast Folk Musical Magazine, and a veteran of the heady Greenwich Village folk scene in the 1960s, where he was a cohort of Bob Dylan, Hardy has been living in nearby Callicoon, NY for more than a decade. An extra bonus of this recording is the presence of Todd Scheaffer, who would go on to found From Good Homes, whose RCA-released album became a national critics' favorite. This fine Wilkes-Barre/Scranton area band released two fine albums over its on-again-off-again existence. Marked by first-rate writing and especially tasteful musicianship, Mere Mortals appeared on HGM in both studio recordings and in a live concert. This mellow song is one not included in either of their releases. From Stroudsburg, PA, Kate & CJ are an appealing acoustic folk duo who both compose and have a wonderful sense of vocal harmonies. Kate Jordan has been appearing on Homegrown Music since 1980. From Scranton and Wilkes-Barre, Freight Train are among the most requested bands on Homegrown Music. With their relaxed, folky-jazzy sound, and their ability to improvise and "jam" with outstanding musicianship, the group has developed a large, well-deserved following. Another example of eclecticism nonpareil. With instrumentation limited to violin, soprano sax and guitar, this Allentown quartet has one of the most distinctive sounds around, aided by T. Roth's theatrically-steeped vocals. The group released a CD a few years ago, broke up and then re-formed in 1996. This previously unreleased song features the group at its appealingly eccentric best. From Peckville, PA, Flannery has been one of Homegrown Music's most frequent guests in recent years. An extremely prolific songwriter, his lyrics run from the thoughtful to the whimsical. This composition is from a work-in-progress called "The Anthracite Shuffle," a musical and theatrical opus dealing with the region's mining heritage. Guests on this recording include artists brought together by HGM producer George Graham for a "Gathering of Singer-Songwriters," who have since become friends and musical collaborators. The premise behind this group is fascinating combination of traditional Irish music in a jazzy style with classical instrumentation. With extensive experience in all three genres, along with virtuoso musicianship, this fine Harrisburg, PA-area family trio was signed for a national album deal on the basis of their Homegrown Music recordings. Texas-born Bethlehem resident Phil Pilorz is one the region's most versatile musicians, playing blues, jazz, folk and straight-out rock & roll with a lot of class. This song is not really representative of Phil's work, but has been another of the most requested on Homegrown Music. Phil, with his laconic wit, uncovers the ultimate political conspiracy and alerts us all to it, "before it's too late..."
Recorded at a live Homegrown Music concert 12/22/82. Engineered by Debbie Makara. Reading, PA, guitarist Cullen was featured on the first Windham Hill Guitar Sampler album. Combining classical training and a jazz sensibility, Cullen represents the best of "new age" style guitar on this beautiful composition. All selections produced in the studios of WVIA-FM for the Public Radio series Homegrown Music. Thanks to the over 400 groups and artists who have appeared on Homegrown Music, and a warm acknowledgement those not included in this first volume. Special thanks to the contributing listener-members of WVIA-FM for their support of the station and its presentation of original music by regional artists for over two decades. To George Graham's Home Page | What's New on This Site. Content and Design (c) 1997 George D. Graham.